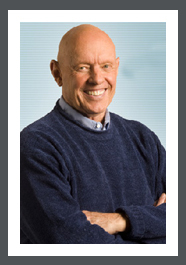 Stephen Richards Covey is the author of the best-selling book, The Seven Habits of Highly Effective People. Other books he has written include First Things First, Principle-Centered Leadership, and The Seven Habits of Highly Effective Families. In 2004, Covey released The 8th Habit. In 2008, Covey released The Leader In Me—How Schools and Parents Around the World Are Inspiring Greatness, One Child at a Time. He is currently a professor at the Jon M. Huntsman School of Business at Utah State University. He sold over 20 million books and these books were reflected through more than 36 languages. The 7 Habits of Highly Effective People was named the #1 Most Influential Business Book of the Twentieth Century. His last book “The 8th Habit”, has sold nearly 400,000 copies. He is an International Man of Peace Award. He has a MBA from Harvard and doctorate degree from Brigham Young University. He is the co-founder and vice chairman of Franklin Covey, the leading global professional services firm with offices in 123 countries. He won the International Entrepreneur of the Year Award. “Covey’s philosophy for creating more meaningful relationships and successes in the workplace is one we should be striving to implement throughout business and industry, in the home and elsewhere, if we expect to be rewarded with happiness and a fulfilling future.” – Sam Walton, Chairman, Wal-Mart Stores, Inc.